The publishing process on Scribd is comprised of uploads and conversions. Uploading gets your documents from your computer to Scribd, while conversion transforms your documents from their original file formats to iPaper. Usually the publishing process succeeds quickly, but on occasion, one or both halves of the publishing process may fail. Publishing failures can take different forms - sometimes uploads will freeze and never finish; sometimes an upload will finish but not appear in the "approve" screen. Sometimes documents will upload but will display the error “unable to convert.” Regardless of the symptom, the end result is the same - you can't publish your docs. This blog post covers basic troubleshooting of the most common problems encountered during the upload and conversion processes. The steps and precautions described below solve the majority of upload-related issues that come into our support queue. Before you're ready to upload, check your documents to make sure they're convertible to iPaper. Corrupted or malformed documents run a higher risk of conversion failure, even if the error is not visible in the body of the document. Errors are more liable to crop up in documents loaded with extraneous meta-data, tracked changes, revisions, uncompressed images and vector drawings, embedded multimedia, and the like. If a Microsoft Office/OpenOffice.org document persistently fails to convert, open the document in its original application and re-save a fresh copy in the original format. If the upload still fails, try saving the document in a simpler format, such as .rtf (rich text format). If errors persist, convert the document to PDF and then upload to Scribd. 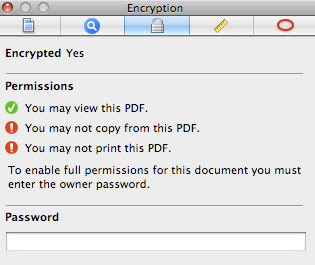 Secured PDFs (also called "encrypted" and "password protected" pdfs) cannot be converted to iPaper. A PDF is "secured" when the document's author uses PDF's built-in security mechanisms to limit features and prohibit further unauthorized editing by the public. Under the law, we must respect the security settings of the original source document. A secure document looks no different from a standard document to the casual viewer. 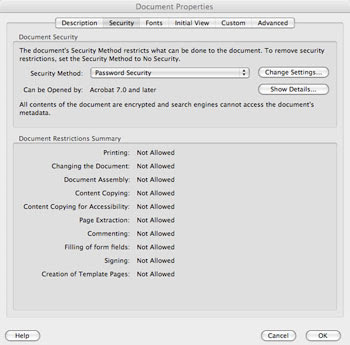 To verify a PDF's security settings, open it in your favorite reader and locate the security settings in the properties dialog. If a document is 'secure,' the PDF must be re-created with no enabled security features. Uncompressed PDFs with large file sizes run a higher risk of a conversion failure. Optimizing your PDFs increases your chances of successful conversions. Users of Adobe Acrobat Professional should check out Adobe's online instructions for reducing PDF file size and using the Acrobat PDF Optimizer. There are also a number of third-party optimization tools available from your favorite software archive. You may be able to create optimized versions of existing PDFs by "printing" a new PDF with a printer-driver PDF writer (such as PDFCreator for Windows). The most essential element to a successful upload is a steady network connection. Broadband users should experience no problems, but users with slow or "noisy" dial-up connections may have difficulty completing uploads under most circumstances. Now most of you will recognize the main bulk uploader from the upload page, pictured above. 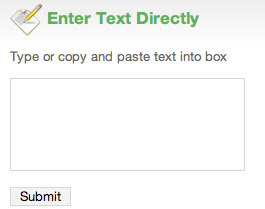 This button is how most users upload their documents to Scribd. It may not be readily apparent, but this uploader is made with Adobe Flash (just like our iPaper viewer), which means that you'll need the Flash player installed in your web browser to use it. Most Scribd users already have the Flash player installed, but we've found that Scribd works best when you're using the most recent version of the Adobe Flash player. Upgrading the Flash player is a breeze, and it's free. Just visit http://adobe.com/products/flashplayer/ and follow the on screen instructions. Don't forget to seal the deal by restarting your browser once the upgrade is complete. Now, we know from our feedback that a large percentage of Scribd users are "power users" that like to trick out their browsers (usually Mozilla Firefox) with lots of add-ons and that make browsing easier and add extra layers of security to the browsing experience. If this sounds like you - and you know who you are - make sure that your browser security settings and add-ons like AdBlock, NoScript, Flashblock, Flash Killer and the like allow upload and download traffic from scribd.com. There are also cases when workplace IT policies block Flash-enabled sites like Scribd across the company. Under these circumstances, there's little you can do except wait until you have access to a public network. You should never use Scribd where it's use is prohibited. Under certain rare circumstances, our upload system may choke on filenames that are unusually complex, especially those with non-English characters, which causes some uploads to freeze. Simply change the filename to something short and basic, and try again. If you're still unable to get the Flash uploader to work, try uploading one file with our single-file uploader. The single-file uploader is plain ol' HTML, so if the upload is still unsuccessful, there may be larger issues with upload traffic on your network. This is the Upload by URL box. Here you can enter the address of a document on the Internet, and upload it to your account on Scribd. The slurp uploader can only accept links to documents that end in an extension of a format that Scribd accepts, such as .doc, .docx, or .pdf. Occasionally, the slurp uploader will choke on URLs that are extremely complex. If the slurp fails, try downloading the document to your hard drive and uploading it through the bulk or single-file uploader. Note that many documents slurped from the Internet are secured, which prevents us from converting it to iPaper. Remember, you should only slurp documents that you have license to share. 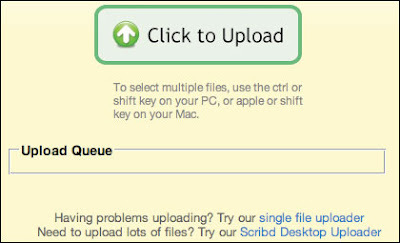 If you're still unable to upload your documents, email us at contact [at] scribd.com, and be sure to provide as much information as you can, including your operating system brand and version, the browser you’re using to upload the document, and the version of the Flash player installed in the browser.